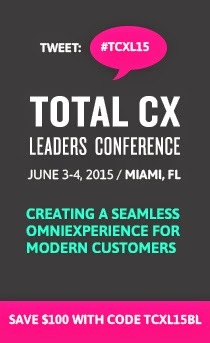 As we begin looking forward to the 2012 Total Customer Experience Leader's summit, we'll be presenting some of the key takeaways from our 2011 event. Pictured here is a Wordle of our executive summary notes. I've stripped out the two most obvious words"Customer" and "Experience" to drill down a bit more into the heart of our takeaways. One thing that immediately strikes me: how action-oriented these words are. "Make, create, integrate," and "change" all jump out. That's what we hope for from this event: that our attendees will leave with actionable insights that they can immediately integrate into their existing strategies when they return to the office. Another big theme: Culture, Ecosystem & Employees. Kerry Bodine's session at last years event focused on this particularly, with the theme summed up in the following sentence "The Customer Experience Ecosystem is a complex set of relationships among your company’s employees, partners, and customers that determines the quality of the experience." Don’t just target segments, go out and talk to people and create personas based on behavioral attitudes. Did you attend Total Customer Experience Leaders in 2011? What were your key takeaways?